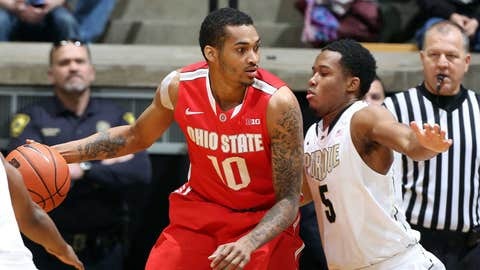 LaQuinton Ross had 25 points and 12 rebounds for the Buckeyes in their 78-69 win over Purdue on Tuesday. Nothing is going to come easy in Big Ten basketball over the next two-plus months. That includes beating Aaron Craft and LaQuinton Ross. Ohio State improved to 14-0 on the season and more importantly 1-0 in the Big Ten on Tuesday afternoon with a rugged 78-69 win at Purdue, the kind the Buckeyes put away over the final few minutes and the kind in which nothing came easy for either side. 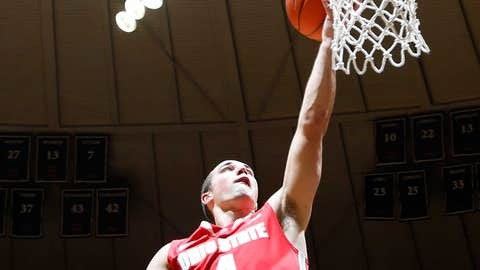 Ohio State Buckeyes guard Aaron Craft lays the ball in against the Purdue Boilermakers at Mackey Arena. Ohio State had a season-high 21 assists and only 6 turnovers. The Buckeyes won despite shooting a putrid 4-of-22 on 3-pointers and being outrebounded by 12 because they forced 12 Purdue turnovers and because Craft and Ross were the best players on the floor. Ross had 25 points and 12 rebounds on 8-of-17 shooting. "He understands the offense better," Ohio State coach Thad Matta said of Ross. "He is being patient and getting a good feel. And heÃ­s being aggressive. That’s one of the big things we want from that spot, to be aggressive." Craft had seven points, 10 assists and four steals. Ohio State’s only bench points came from freshman Marc Loving, who scored eight on a pair of 3-pointers. The Buckeyes are going to need that shooting. And to keep riding Craft and Ross. There were three other Big Ten openers played on New Year’s Eve, all involving at least one perceived contender. Ohio State’s was first, meaning the Buckeyes were alone at the top of the league for a couple of hours. What a couple of hours at Purdue showed them was that staying there — or even close to the top — is not going to be easy.